The 4th San Diego Folk Festival was held at San Diego State College during the Spring of 1970. Festival number four was the first one I booked solo. Before then I had always had to answer to a committee. Now Gary Solbue decided that one person should be responsible and I was that person. This festival was the first to feature old-timey duo Ray and Ina Patterson from Woodland Park, Colorado, and U. Utah Phillips, the Golden Voice of the Great Southwest, a rumor in his own time and all that stuff. Bessie Jones and the Georgia Sea Island Singers returned and we had Louisiana bluesman Robert Pete Williams, Houston Texas bluesman Weldon “Juke Boy” Bonner, Hollendale Mississippi bluesman Sam Chatmon, and Texas by way of San Diego bluesman Thomas E. Shaw. Mayne Smith and Mitch Greenhill had teamed up with Mark Spoelstra into a band called the Frontier Constabulary, and Kenny Hall, Ron Tinkler, and Jim Ringer now played together and called themselves the Sweets Mill String Band. The festival audience was growing and our budget was starting to reflect that growth. I was beginning to find out that you could book unknown performers or unknown kinds of music at a folk festival and still guarantee them a crowd of appreciative listeners. People were starting to trust my taste in music. Thomas Shaw, along with Bessie Jones and the Georgia Sea Island Singers performing Adam & Eve, Trouble So Hard. Jane Voss and the Berkeley Strict Temperence Choir performing Bright Morning Stars Are Shining. Kenny Hall playing Creole Belle Two-Step. Sam Hinton on harmonica, playing Hog On The Mountain. Robert Pete Williams performing Find Me A Way. Robert Pete Williams, performing Here Come That Greyhound. The Sweets Mill String Band performing Frankie and Johnny. Weldon “Juke Boy” Bonner performing Over Ten Years Ago. Rosalie Sorrels, performing Lonesome Roving Wolves. 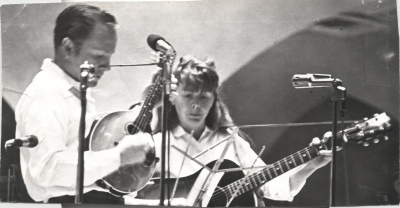 Ray & Ina Patterson, performing In The Pines. Sam Chatmon and Kenny Hall performing Please. Sam Chatmon and Kenny Hall performing Sittin’ On Top Of The World. Janet Smith singing The Unicorn.